Charlie Miller fears the knives are out for Ally McCoist at boardroom level - but he still believes his former team-mate is the right man to lead Rangers to the top flight of Scottish football. 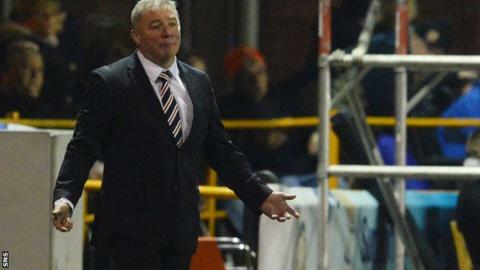 Pressure has intensified on McCoist after Rangers' 3-2 defeat at the hands of Alloa in the Petrofac Training Cup. "It looks as if people upstairs are sharpening the knives," said Miller. "A lot of fans have also gone against Coisty, which is unfortunate, because I still believe he can do the job." Rangers also trail Hearts by nine points in the race for the Scottish Championship title. Discussions between senior figures at Ibrox have taken place concerning a run of one win in four games. It is understood sacking McCoist and his assistants would cost the club around £1.4m. But Miller, who won five league championships with Rangers, says McCoist deserves the chance to take the club to the Premiership. "I still believe Coisty can do the job he expects to do, that he wants to do - and that is obviously getting us back to the Premier League," Miller told BBC Scotland. "I believe he deserves that chance, because he has held the club together for the last three years in my eyes. "I'm still at the point where I can't believe people are even speaking about sacking Coisty. I'm actually really, really upset about that. "And £1.4m is a hell of a lot of money for Rangers to give out and then bring someone else in who would maybe want to buy players in January. "It's a difficult one because we don't really know who's running the club. It's just a shame that it's got to this point." Rangers lost to Alloa at Recreation Park in midweek despite being 2-0 up with less than 20 minutes to play. McCoist's men went into that game boosted by a 3-0 Scottish Cup win over top-flight Kilmarnock at the weekend. "Obviously it was a disappointing result the other night," added Miller. "I don't blame Coisty for that, we were 2-0 up with 20 minutes to go. We've got a lot of experienced players on the field, they should have taken care of Alloa. "The buck ultimately stops with the manager, that's football, and Coisty understands that. "He's not a stupid man, he knows it's his team and if results aren't going the way they're expected then he's going to get a bit of abuse from certain quarters. "Coisty has a very good football brain, I knew that when I played with him. "I have never worked under him as a coach, so I can't talk about his coaching qualities. "Sometimes Rangers have been hard to watch this season - I'm not going to deny that. But some games have been magic, so that also has to be down to the players."